Винчестеры HDD 1TB 7200rpm SATA EnterpriseHDD 2TB 7200rpm SATA EnterpriseHDD 3TB 7200rpm SATA EnterpriseHDD 4TB 7200rpm SATA EnterpriseHDD 5TB 7200rpm SATA EnterpriseHDD 6TB 7200rpm SATA EnterpriseEntry level SSD for servers (SATA, 100/ 200/ 400/ 800GB)Midrange SSD for servers (SATA, 100/ 200/ 400/ 800GB)HDD 1TB SAS 7200 rpm ( предусмотреть SAS контроллер ) HDD 2TB SAS 7200 rpm ( предусмотреть SAS контроллер ) HDD 3TB SAS 7200 rpm ( предусмотреть SAS контроллер ) HDD 4TB SAS 7200 rpm ( предусмотреть SAS контроллер ) HDD 6TB SAS 7200 rpm ( предусмотреть SAS контроллер ) HDD 300GB SAS 15K rpm ( предусмотреть SAS контроллер ) HDD 600GB SAS 15K rpm ( предусмотреть SAS контроллер ) High-End SSD for servers (SAS, full duplex, dual port, T10 PI) ( предусмотреть SAS контроллер ) HDD 300-900GB SAS 10K rpm ( предусмотреть SAS контроллер ) 1 шт.2 шт.3 шт.4 шт. 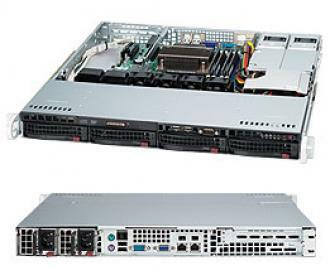 Supermicro leverages its deep expertise in server technology to bring customers the latest generation in UP server solutions with the X10 series of motherboards, optimized chassis, and servers. These advanced technology building blocks offer the best server and workstation performance with the latest Intel® Xeon® E3-1200 v3 CPUs, up to 4 DIMMs support up to 1600MHz memory speed, and SAS 2.0 or SATA 3.0 (6Gbps) HDDs. Improved I/O for significant increases in workstation 3D and media performance is provided by PCI-E 3.0, USB 3.0, and triple digital display support; and server quad Gigabit Ethernet LAN technology option. Power efficiency is not sacrificed due to DDR3L (1.35v) support, LV CPU SKUs, digital platinum level high-efficiency power supplies, and application optimized cooling.